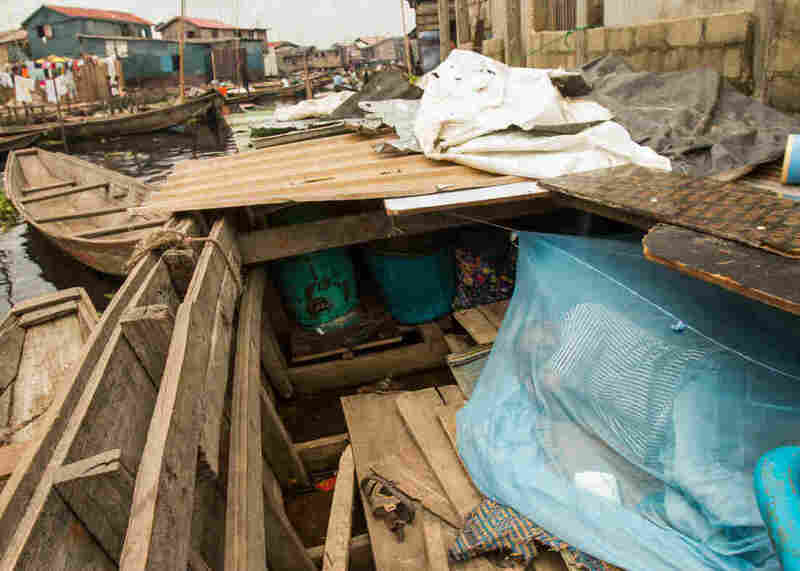 Salako Hunsa lives in a canoe in the Makoko waterfront settlement in Lagos, Nigeria. His home was burned down last month. At 5:30 a.m. on April 9, Salako Hunsa awoke to the sound of gunfire. He left his wife and five children inside the house, and ran out to a shocking scene: A squad of police officers shooting indiscriminately and setting fire to his neighbor’s homes. “I had to run for my life,” Hunsa says. By the time the sun rose, the neighborhood was leveled, thousands of people were homeless and one young man was dead. The attack was a dramatic turning point in an ordeal that for Hunsa and thousands of his neighbors is far from over. Hunsa was a lifelong resident of Otodo Gbame (pronounced BOM-ay), an informal waterfront settlement in Lagos, Nigeria, that is the front line of an ongoing conflict over the rights of some of the city’s poorest residents. Africa’s most populous city is situated between a large lagoon and the open Atlantic. 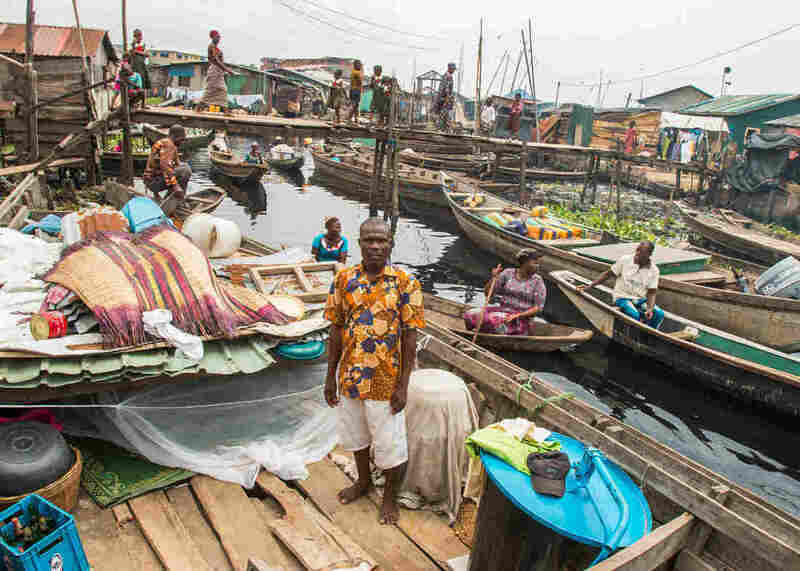 At dozens of locations across the city’s coastlines, at the boundaries where frantic markets, office towers and high-rise apartments meet the water, more than 300,000 people inhabit slums like Otodo Gbame (which translates roughly from the local Egun language to “community in the bush,” a nod to its origin as a swamp). Most residents eke out a living by fishing from hand-built canoes. They live in makeshift homes made of wood and scraps and elevated on stilts as a precaution against flooding. Access to clean water, electricity, schools and other vital services is scarce or nonexistent. These communities are perhaps the most visible manifestation of the profound income inequality in Lagos. While the oil and finance industries have buoyed a few thousand Lagosians into stratospheric wealth (marked by gleaming black Escalades and boutique markets selling French oysters), one-fifth of the city’s 21 million residents are either living in or at risk of poverty, according to a 2016 Oxford University study. 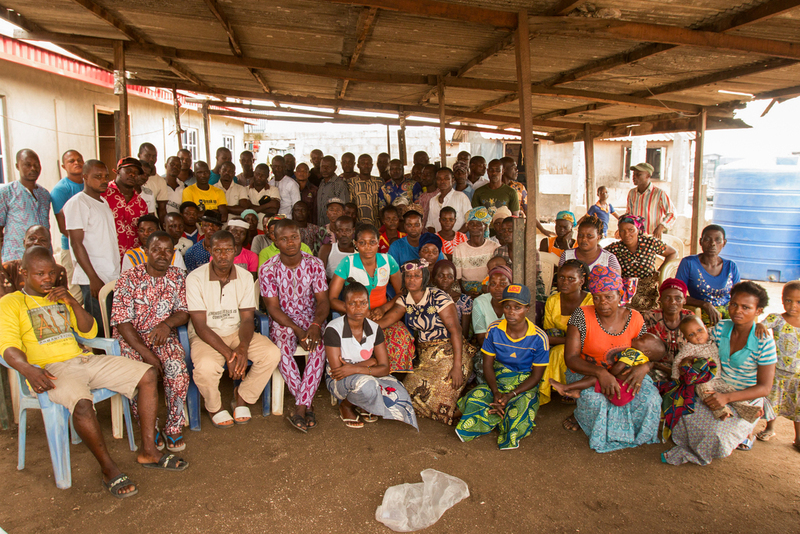 Former residents from the waterfront settlement of Otodo Gbame in Lagos. They’ve been displaced and are now living in Makoko, another waterfront slum. Residents of the waterfront settlements represent the city’s lowest socioeconomic tier. But they also happen to occupy prime real estate in the city with Africa’s fastest-growing population, where waterfront property increasingly rivals the prices of New York or Miami. Now they’re the target of a government eviction campaign that city officials say is motivated by health and security concerns, and because the settlements are “illegal, without any title or appropriate government approval.” But residents and watchdog groups say the evictions are no more than a blatant, and sometimes violent, grab for land that’s been occupied by the same families for generations. “This is the problem, they are surrounded by wealth,” says Morayo Adebayo, a researcher at Amnesty International Nigeria. That makes the land an attractive acquisition for “the posh places” nearby, she says. Residents of waterfront settlements have experienced harassment from the police and wealthy neighbors for years. Trouble escalated in October, when Lagos State Governor Akinwunmi Ambode issued a warning that he planned to order the “demolition of all the shanties around the creeks in Lagos State and also around our waterways.” His concern was that some communities may have been sheltering suspected kidnappers (a major crime problem in Nigeria). That accusation was vigorously denied by the Justice and Empowerment Initiative (JEI), a local legal nonprofit representing community residents in court. In January, the Lagos State High Court spelled out those rights in an injunction that found the government’s practice of forced evictions amounted to “inhuman, cruel and degrading” treatment incompatible with Nigerian and international human rights law. The court put a stay on future evictions and initiated a process to mediate some kind of agreement between residents and the government. Nevertheless, in March the police returned with a crew of demolition workers and bulldozers, this time with a mission to “clear” structures “to ensure that the waterfront area is free from environmentally injurious and unsanitary habitation.” Another 4,700 residents lost their homes, according to JEI. The final blow came April 9, when the remaining few thousand residents were chased out and what was still left of the community razed. In the melee, a 22-year-old resident named Daniel Aya was shot in the neck and killed. Residents blame the police or thugs working for them, but the government denied responsibility. An investigation is pending while Aya’s body waits in a morgue, his father, Hungbo Aya, says. By the time Salako Hunsa realized what was happening that day and rushed back inside to collect his wife and children, they had already fled. Because police had blockaded the shore, there was nowhere to go but the water. Hunsa jumped in and swam for 30 minutes until he was picked up in a friend’s canoe. All of the family’s possessions were left behind and destroyed in the fire, along with virtually every structure in the settlement. Drone footage captured by activists after the eviction reveals the extent of devastation. A group of former Otodo Gbame residents who are now living in Makoko. Hunsa found himself paddling to the city’s largest waterfront settlement, Makoko, along with most of his neighbors. When they arrived a few hours later, they parked the canoe in one of the countless narrow canals that wind through the neighborhood. He found his family, and they’ve been living there since — inside their canoes. Makoko is already overcrowded, and the more than 1,000 displaced Otodo Gbame residents who are now living there have no choice but to sleep in the vessels that brought them. Hunsa’s canoe is big enough to accommodate several people; they sleep on mats on the floor underneath mosquito nets hung from a makeshift roof of metal sheeting. A steel oil drum with a discarded satellite dish for a lid serves as a cabinet. The canal inches below where they sleep serves as a public toilet and waste dump. Getting food is a daily struggle that involves some combination of borrowing it from others, food aid from local NGOs or buying it with cash from the occasional odd job. Hunsa was a rare exception to the prevailing fisherman profession; he washed clothes at a laundromat in a nearby neighborhood and was fired when he didn’t show up after the eviction. But even the fishermen are unable to find work. Most of their equipment was lost during the eviction. The waters around Makoko are unfamiliar, so they don’t know where to look for fish. And the Makoko fishermen are territorial, so the newcomers aren’t welcome. There’s a cruel irony to the plight of the displaced peoples: Castigated as squatters in one place, they have been chased to a place where they truly are squatters and admit as much. Tosinhun said he knows it’s only a matter of time before they wear out their welcome in Makoko, but that most people don’t know where they will go next. The situation reveals a fundamental flaw in the government’s approach, JEI’s Chapman says. “Demolitions aren’t a solution to slums. They just push people deeper into poverty, and they move to a different slum,” she says. The primary legal objective of the residents’ case against the government, she says, is to regain access to their land, although she acknowledges it’s an “uphill battle” given that the land is adjacent to an estate owned by one of Lagos’ wealthiest families, is still blockaded by police and is already being bulldozed to make way for future construction projects. With the governor’s original ominous warning (“demolition of all the shanties”) still lingering, residents of Makoko fear that their waterfront settlement could be next. Chapman’s legal strategy is to think big. “We want to make this as painful as possible for the government as a deterrent to future evictions,” she says. For Otodo Gbame’s former residents, there’s little more to do than to stand by and hope for the best. Tim McDonnell is a multimedia environmental journalist from New York. Currently he is a Fulbright-National Geographic Storytelling Fellow covering climate change in Kenya, Nigeria and Uganda. Follow him @timmcdonnell.